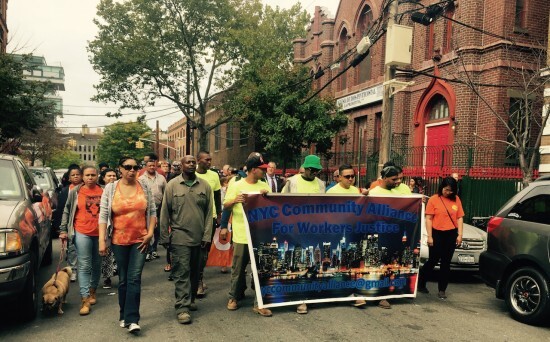 Protesters march along E. 162nd Street toward 3rd Avenue on Sept. 22, to demand safer working conditions for workers at affordable housing sites. About 100 union members and activists gathered in front of the Bronx Borough Courthouse on the Grand Concourse Tuesday to protest unsafe conditions for non-union workers building the city’s affordable housing — much of which is being erected in the South Bronx. 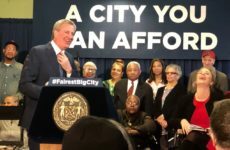 Community groups comprising the Real Affordability For All Coalition (RAFA) and organized by New York Communities for Change and Community Action for Safe Apartments joined with striking workers and elected officials for a rally and march through the neighborhood. “We are fighting to get these workers the dignity and support that they deserve, so that they can retire with dignity. That’s why we are here,” said Vocal New York’s community leader David Smith. Antony Williamson, a community organizer with Construction and General Building Laborers Local 79 yelled “Workers! Workers!” into a megaphone, leading the chanting crowd. Wearing mostly bright orange and neon green union T-shirts and chanting in English and Spanish, the group marched to two construction sites at 316 E. 162nd St. and at 3160 Park Ave., affordable housing sites using nonunion labor. Cars honked and people screamed from their balconies to show support for the group, which included 10 striking workers. 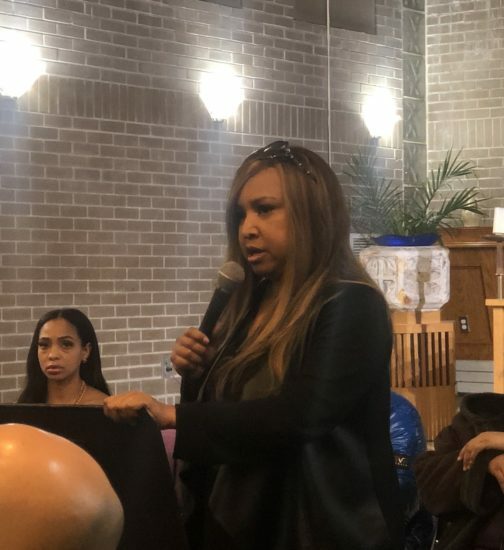 Borough President Ruben Diaz Jr. and New York State Assemblymember Victor Pichardo also came to show support. Sonia Medrano came all the way from Brooklyn. At the second address, protesters became more confrontational, urging workers to join the protest. “Walk off the job! Walk off the job!” they chanted. 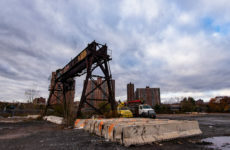 The group’s complaints focused on subcontractor U.S. Crane and Rigging, which declined to comment on the protest, and is involved in construction at 316 E. 162nd St., owned by Urban Pathways. The general contractor for that project, Lemle & Wolff Construction Corp., is on the city’s Housing Preservation and Development’s Enhanced Review list, meaning it’s subject to increased scrutiny as the result of labor complaints. Gary LaBarbera, president of the Buildings and Construction Trades Council of Greater New York, called out the rigging company’s owner by name, claiming unsafe conditions and lack of training and safety equipment. The targeted site at 3160 Park Ave. is owned by Trinity Park Avenue Affordable LLC and the contractor is Mega Contracting Inc. LLC. The demonstration came as public review began for new zoning rules that would require 25 to 30 percent permanent affordable housing in medium and high-density areas rezoned to significantly increase housing capacity, according to the City Planning Commission. Though they did not cite the proposal specifically, protesters insisted that any new affordable housing be built by union workers. “That’s all they want. That’s the American dream,” Mr. La Barbera said into a megaphone, standing in front of one of the construction sites.